EBay has taken auctions to a global level since it began in 1995. You can buy items up for auction in the U.S. or Australia – or in Britain of course. It’s also expanded the number of things people consider as auctionable goods and made the idea of the online auction commonplace in the life of so many people. 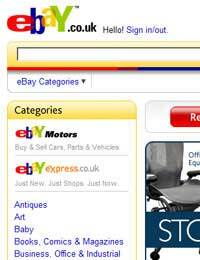 If you want to buy or sell using eBay, you need an account, for which you have to register. It’s free – but if you decide to sell, you do pay a fee for uploading the item for auction and a percentage of the sale price – this is how eBay makes its money. You’ll need to list a credit card if you’re selling – payment is done through this. The site does have a number of tools you can use to make your listing stand out. Some are free, others cost money (unless you have a relatively high-ticket item, there’s probably no point in using the tools or listing features that will require extra payment). It’s worthwhile having a photo of the item you’re selling – in some cases several photos can be preferable to properly illustrate your item. It costs more to add additional pictures, but the cost is minimal and can reap greater rewards. Offer a full description and be honest about any flaws. You also need to set the length of your auction – you have several options, from a brief, one-day event (which is generally not a good idea) up to 10 days. As a general rule, seven days is good. It’s long enough for most people to be aware of your item and for them to bid. It helps to get your item is as many categories as possible, so use plenty of keywords – this increases the chances of getting bids. You can monitor the auction using the “My eBay” facility. Once the auction has finished, you receive payment before shipping the item (be sure to state that the purchaser is responsible for shipping costs). Go to the Post Office and determine the shipping price and include it in your item description. It’s also worth registering with PayPal. This can greatly speed up payment (although be aware that they do take part of the amount). There are also eBay stores and power sellers, but unless you’re planning on selling a lot of items, these needn’t concern you. Feedback is one of the most important features of eBay. Sellers and buyers leave feedback for each other on each transaction. It’s through this that you build up a rating and the better your feedback, the more reliable and trustworthy you are. Given that prospective buyers can’t physically see the item before buying it, this build up of trust is important. For that reason alone, it’s important to leave feedback on every transaction, whether buying or selling. If you win an auction, it’s important to pay quickly – within three days is acceptable. Don’t bid if you don’t mean to buy and certainly don’t bid more than you can afford! Be aware of what similar items fetch and bid accordingly – there’s no point spending £100 for an item you could purchase for £50 a week later!